What is the .eco trustmark? 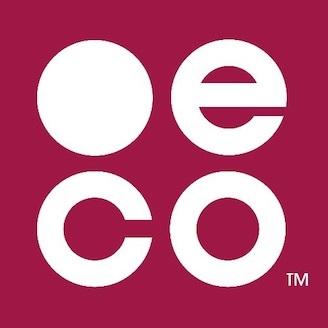 The .eco trustmark is an easy way for you to highlight your membership in the .eco community. It creates a clear connection between your .eco website and your .eco profile. Just as you might put a Facebook icon on your webpage that links to upcoming events or an Instagram icon that links to your best pics, you can use the .eco trustmark to link to your .eco profile and showcase your commitment to a sustainable future. The example below is taken from profiles.eco. It shows the .eco trustmark listed alongside other social network icons. Another way to use the .eco trustmark is to include it with other certifications or partners that you list on your website. How do I set up the .eco trustmark? You can access this functionality via the trustmark section at the bottom of your .eco profile. This section is only visible when editing your .eco profile. When configuring your .eco trustmark, you can choose the color and type of icon to use. This will generate an HTML code snippet that you can then copy and paste into the appropriate location on your .eco web site. 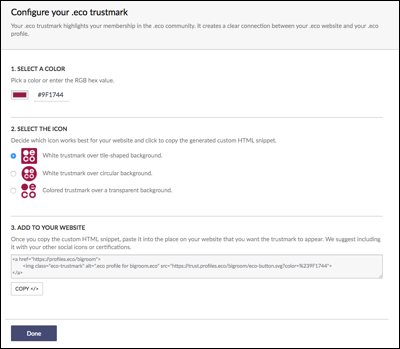 Once your .eco trustmark has been successfully added to your .eco website, the trustmark section will confirm that the connection has been established. How can I resize the .eco trustmark? By default, the trustmark icon will fill the HTML container that you place it in on your website. You can constrain the size of the HTML element that the trustmark HTML code snippet is inserted into, by using CSS or by explicitly sizing the element. Can I add the trustmark to a non-.eco web site? Yes, as long as your .eco domain name redirects to the web site that you add your .eco trustmark to.